"Presents aren't necessary. However, if you'd like to give something please make it or recycle it, but no need to buy anything new." Perfect! Almost every year since my son was two (an entire decade! ), I make flower fairies. Sometimes they're for us, sometimes they're to give. Since our fairy family is currently out on one of our nature shelves, I wasn't surprised when my daughter suggested making one for her birthday friend. We generally create them using a modified version from the Salley Mavor's Felt Wee Folk in combination with instructions from the Flowerina kits no longer available from Chinaberry (in 2000!). I don't know what I love most about these little dolls... they definitely tap into that part of me that believed in fairyland... maybe still does. Salley's book may not be new to some of you, as it was published 7 years ago, but I can't recommend more highly. 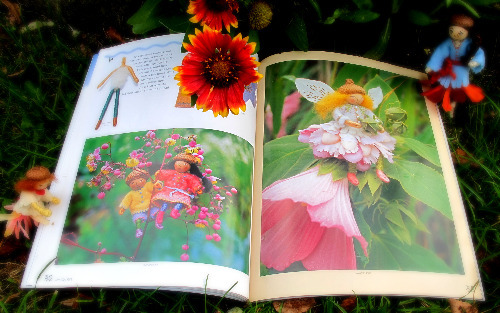 It's bursting with enough gorgeous photographs of her brilliant felt illustrations and miniature dolls to inspire even the most reluctant crafter... but it also comes with very clear instructions so that you can confidently make a wide variety of figures: from pirates to royalty... to these gorgeous harvest folk perfect for right now! 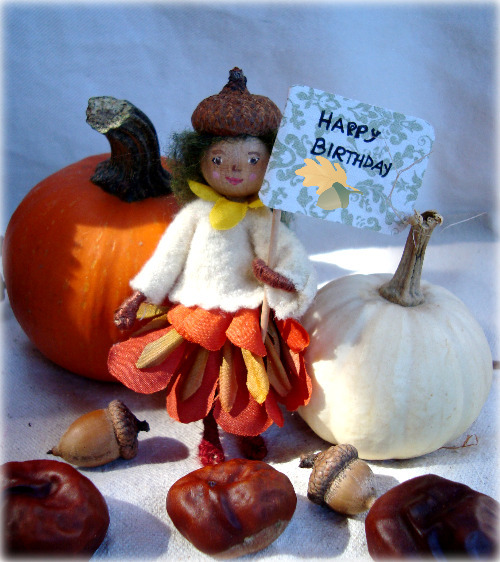 Here's the little fall birthday fairy my daughter and I made (without a trip to the store). After our first frost, our garden flowers were dwindling, but she gathered the last of them to make a mini bouquet "to keep the fairy company in her new home". 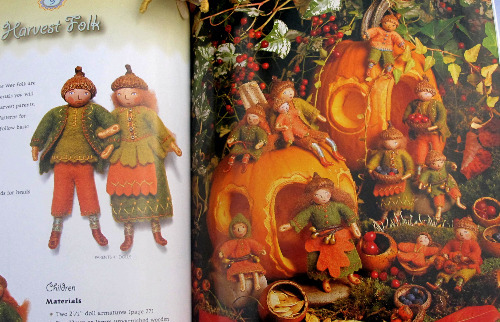 If you're interested in making these enchanting little folk, I can't recommend this book more. Salley is a genius and the projects even include felt brooches and purses... enough ideas to give as gifts, top presents, and stuff into stockings in the upcoming months. I know we'll be gathering by the wood stove for another fairy making session some time soon. Maybe you will, too. That book looks fantastic! I already put it on my wish list. If I can get my act together they would be perfect for christmas gifts. I styled and did an article on Sally for ME Home Companion magazine many years ago....O, the day spent in her studio inspired me forever and still! So love her work- fantastic and timeless! Charlotte how exciting on both accounts: Salley and ME! What a dream to be in Salley's studio! I'm a bit envious, of course! How adorable! There are just too many great projects and ideas out there! I just love these wee folk. I wish I could make them, but I have never tried felting, and they look complicated to me. 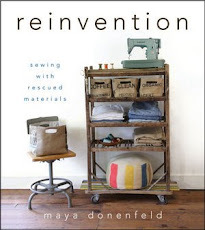 Must I have felting experience before buying this book or are there simple instructions included? I have two grandbabies on the way and would love to make tiny dolls & fairies for them. Those are just gorgeous - what fun!!! Your flower fairy turned out beautifully! Since I have a little boy, we have a whole family of bendy doll pirates that I've made. Jody-You can totally make these! No felting required, just a little hand sewing of crafting felt. All of the instructions are included and there are some very simple dolls to start with. I started making these with my kids when they were tiny, but all of the little parts means that they need to be completely supervised while making them and during play. Have fun! And congratulations on those new grandbabies coming! What a little beauty - she's adorable. I do like her expression. And I'm jealous that you have horse chestnuts - and acorns. Each year I search for conkers with no joy. The local trees don't even acknowledge that it is Autumn. 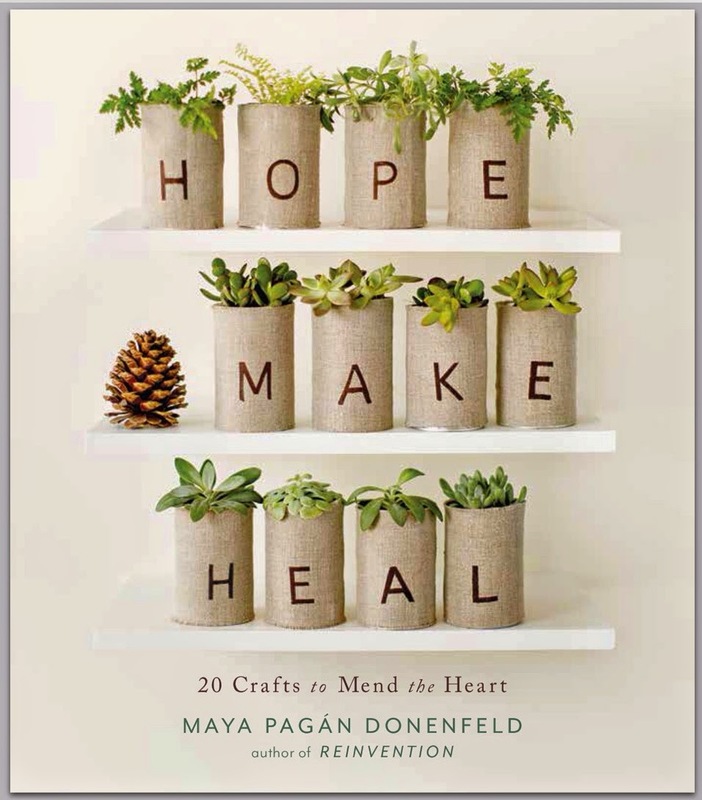 Maya, thanks so much for sharing my book and I'm glad that you keeping returning to it year after year. You and your followers may like to see my new picture book, Pocketful of Posies: A Treasury of Nursery Rhymes. That is an inviting book....thanks for sharing! My Goodness! I absolutely LOVE these :) Your dolls look beautiful too. Thank you for sharing. love all these precious little dolls...and wanted to say i got the woman's day christmas mag today....well done you!!! lovely project and many congrats on your contribution! I just LOVE this book- I remember when I first got it, we made faeries: morning, noon and night!!! I cannot recommend it highly enogh, even to simply look at it is so lovely! I've gotta get my hands on that book. What beautiful work! You may also enjoy the work of Clare Beaton who also does hand stitched illustrations. She's a favorite of mine, but Sally is new to me so I need to run to the library and get all of her books. I read the post,I like it very much.love all these precious little dolls.lovely project and many congrats on your contribution! 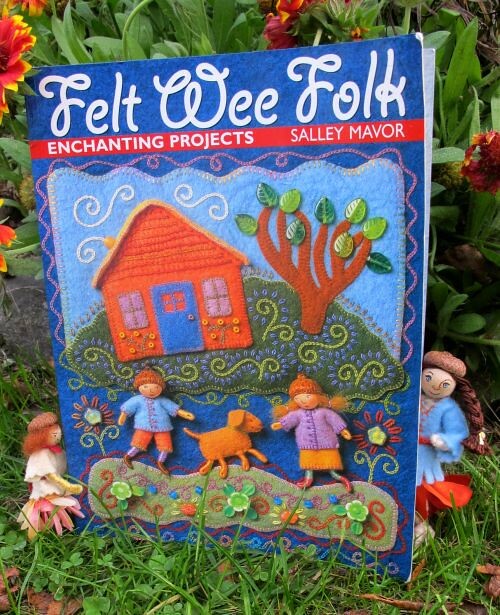 I bought "Felt Wee Folk" this fall after seeing your post. My second baby was so little and my hands so full, that I just now found time to make my first fairy and we LOVE her. Thanks so much for sharing this wonderful idea...I am tempted to fill my whole house with fairies and other wee folk!